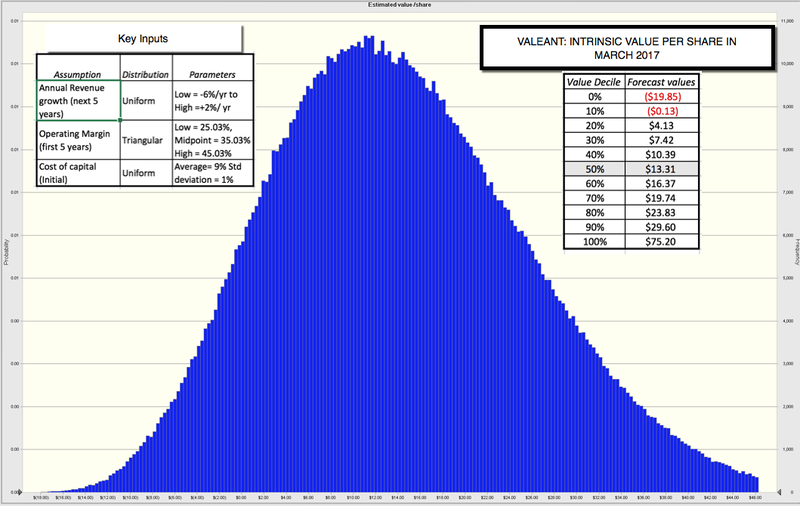 A Valeant Update: Damaged Goods or Deeply Discounted Drug Company? Rats get a bad rap for fleeing sinking ships. After all, given that survival is the strongest evolutionary impulse and that rats are not high up in the food chain, why would they not? That idiom, unfortunately, is what came to mind as I took another look at Valeant, the vessel in my investment portfolio that most closely resembles a sinking ship. This is a stock that I had little interest in, during its glory days as the ultimate value investing play, but that I took first a look at, after its precipitous fall from grace in November 2015. While I stayed away from it then, I bought it in May 2016 after it had dropped another 60% and I found it cheap enough to add to my portfolio. I then compounded my losses when I doubled my holding in October 2016, arguing that while it was, at best, an indifferently managed company in a poor business, it was under priced at $14 . With the stock trading at less than $12 (and down to $10.50, as I write this post) and its biggest investor/promoter abandoning it, there is no way that I can avert my eyes any longer from this train wreck. So, here I go! I won't bore you by repeating (for a third time) the story of Valeant's fall from investment grace, which happened with stunning speed in 2015, as it went from value investing favorite to untouchable, in the matter of months. My first post, from November 2015, examined the company in the aftermath of the fall, as it was touted as a contrarian bet, trading at close to $90, down more than 50% in a few months. My belief then was that the company's business model, built on acquisitions, debt and drug repricing was broken and that the company, if it became a more conventional drug business company, with low growth driven by R&D, was worth $73 per share. I revisited Valeant in April 2016, after the company had gone through a series of additional setbacks, with many of its wounds self inflicted and reflecting either accounting or management misplays. 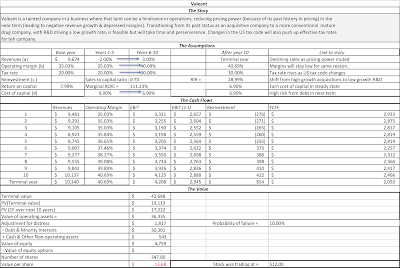 At the time, with the updated information I had and staying with my story of Valeant transitioning to a boring drug company, with less attractive margins, I estimated a value per share of $44, above the stock price of $33 at the time. I bought my first batch of shares. In the months that followed, Valeant's woes continued, both in terms of operations and stock price. After it announced a revenue drop and a decline in income in an earnings report in November 2016, the stock hit $14 and I had no choice but to revisit it, with a fresh valuation. Adjusting the valuation for the new numbers (and a more pessimistic take on how long it would take for the company to make its way back to being a conventional, R&D-driven pharmaceutical company, I valued the shares at $32.50. That may have been hopeful thinking but I added to my holdings at around $14/share. Much as I would like to believe that this decline is short term and that the stock will come back, there is now a real chance that my story for Valeant, not an optimistic and uplifting story to begin with, is now broken. The company's growth strategy of acquiring other companies, using huge amounts of debt, raising prices on "under priced" drugs and paying as little in taxes as possible were perhaps legally defensible but they were ethically questionable and may have damaged its reputation and credibility so thoroughly that it is now unable to get back to normalcy. This can explain why the company has had so much trouble not only in getting its operations back on track but also why it has been unable to pivot to being a more traditional drug company. If researchers are leery about working in your R&D department, if every price increase you try to make faces scrutiny and push back and your credibility with markets is rock bottom, making the transition will be tough to do. It can also indirectly explain why Valeant may be having trouble selling some of its most lucrative assets, as potential buyers seem wary of the corporate taint and perhaps have lingering doubts about whether they can trust Valeant's numbers. In fact, the one silver lining that may emerge from this experience is that I now have the perfect example to illustrate why being a business entity that violates the norms of good corporate behavior (even if their actions legal) can destroy value. At least in sectors like health care, where the government is a leading customer and predatory pricing can lead to more than just public shaming, the Valeant story should be a cautionary note for others in the sector who may be embarking on similar paths. You may find it strange that I would spend this much time talking about Valeant without mentioning what may seem to be the big story about the stock, which is that Bill Ackman, long the company's biggest investor and cheerleader and for much of the last two years, a powerful board member, has admitted defeat, selling the shares that Pershing Square (his investment vehicle) has held in Valeant for about $11 per share, representing a staggering loss of almost 90% on his investment. The reasons for my lack of response are similar to the ones that I voiced in this post, when I remained an Apple stockholders as Carl Icahn sold Apple and Warren Buffett bought the stock in April 2016. As an investor, I have to make my own judgments on whether a stock fits in my portfolio and following others (no matter how much regard I have for them) is me-too-ism, destined for failure. Don't get me wrong! I think Bill Ackman, notwithstanding his Valeant setbacks, is an accomplished investor whose wins outnumber his losses and when he takes a position (long or short) in a stock, I will check it out. That said, I did not buy Valeant because Ackman owned the stock and I am not selling, just because he sold. In fact, and this may seem like a stretch, it is possible that Ackman's presence in the company and the potential veto power that he might have been exercising over big decisions may have become more of an impediment than a help as the company tries to untangle itself from its past. I am not sure how well-sourced these stories are, but there are some that suggest that it was Ackman who was the obstacle to a Salix sale last year. As I see it, there are three paths that Valeant can take, going forward. 1. Going Concern: To value Valeant as a going concern, I revisited my valuation from November 2016 and made its pathway to stable drug company more rocky by assuming that revenues would continue to drop 2% a year and margins will stay depressed at 2016 levels for the next 5 years and that revenue growth will stay anemic (3% a year) after that, with a moderate improvement in margins. With those changes put in and leaving the likelihood that the company will not make it at 10% (since the company has made some headway in reducing debt), the value per share that I get is $13.68. 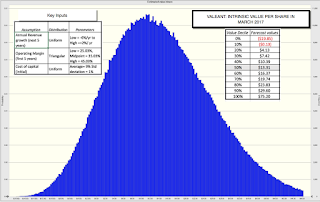 To illustrate the uncertainty associated with this value estimate, I ran a simulation with my estimated distributions for revenue growth, margins and cost of capital and arrived at the following distribution of values. The simulation confirms the base case intrinsic valuation, insofar as the median value of $13.31 is close to the price at the time of the valuation ($12) but it provides more information that may or may not tilt the investment decision. There is a clear chance that the equity could go to zero (about 12%), if the value dips below the outstanding debt ($29 billion). At the same time, there is significant upside, if the company can find a way to alter its trajectory and become a boring, low growth drug company. 2. Acquisition Target: It is a sign of desperation when as an investor, your best hope is that someone else will acquire your company and pay a premium for it. I am afraid that the Valeant taint so strong and its structure so opaque and complex that very few acquirers will want to buy the entire company. I see little chance of this bailing me out. 3. Sum of its parts, liquidated: It is true that Valeant has some valuable pieces in it, with Bausch & Lomb and Salix being the biggest prices. While neither business has attracted as much attention as Valeant had hoped, there are two reasons why. The first is that Ackman, with significant losses on the stock and a seat on the board, may have exercised some veto power over any potential sales. The second is that potential buyers may be scared away by Valeant's history. One solution, now that Ackman is no longer at the company, is for Valeant to open its books to potential acquirers and sell its assets individually to the best possible buyers. Note that this liquidation value will have to exceed $29 billion, the outstanding debt, for equity investors to generate any remaining cash. There is one other macro concern that may make Valeant's future more thorny. As a company that pays a low effective tax rate and borrows lots of money, the proposed changes to the tax law (where the marginal tax rate is likely to be reduced and the tax savings from interest expenses curbed), Valeant will probably have to pay a much higher effective tax rate going forward, one reason why I have shifted to a 30% tax rate for the future. Let's start with the easy judgment. This was not an investment that I should have made and much as I would like to blame macro forces, the company's management and Bill Ackman for my losses, this was my mistake. I was right in my initial post in concluding that the company's old business model (of acquiring growth with borrowed money and repricing drugs) was broken but I clearly underestimated how much damage that model has done to the company's reputation and how much work it will take for it to become a boring, drug company. In fact, it is possible that the damage is so severe, the company will not be able to make the adjustments necessary to survive as a going concern. So, now what? I cannot reverse the consequences of my original sin (of buying Valeant at $32) in April 2017 and the secondary sin (of doubling down, when Valeant was trading at $14) by selling now. The question then becomes a simple one. Would I buy Valeant at today's price? If the answer is yes, I should hold and if the answer is no, I should fold. My intrinsic value per share has dropped to just above where the stock is trading at now, and at this stage, my judgment is that, valued as a going concern, it would be trading slightly under value. In a strange way, Bill Ackman's exit is what tipped the scales for me, since it will give Valeant's management, if they are so inclined, the capacity to make the decisions that they may have been constrained from making before. In particular, if they recognize that this may be a clear case where the company is worth more as the sum of its liquidated parts than as a going concern, there is still a chance that I could reduce my losses on this investment. Note, though, that based on my numbers, I don't expect to make my original investment (which averages out to $21/share) back. I am not happy about that but sunk costs are sunk! As I continue to hold Valeant, I am also aware that I might be committing one of investing's biggest sins, which is an aversion to admitting mistakes by selling losers. 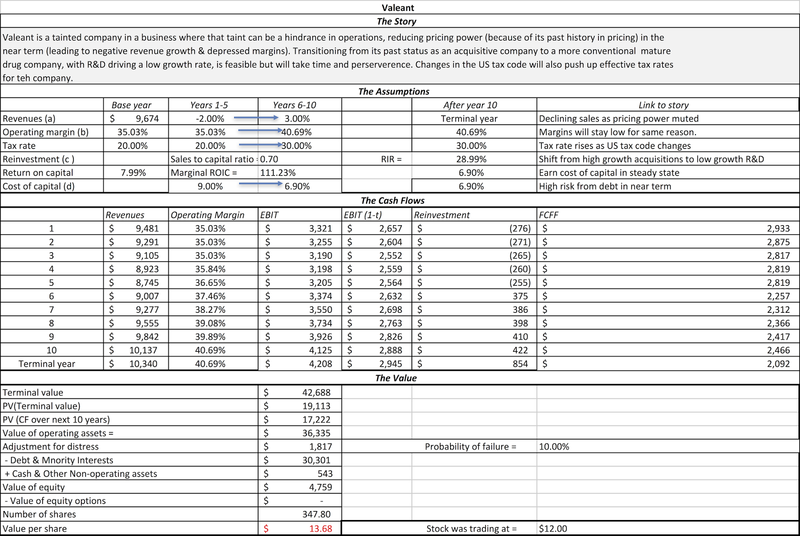 My discounted cash flow valuations may be an after-the-fact rationalizing of something that I don't want to do, i.e., sell a big loser. To counter this, I briefly considering selling the shares and rebuying them back immediately; that makes me admit my mistake and take my losses while restarting the investment process with a new buy, but the "wash sales" rule is an impediment to this cleansing exercise. The bottom line is that if I am holding on to Valeant, not for intrinsic value reasons (as I am trying to convince myself) but because I have an investing blind spot, I will be last one to know! 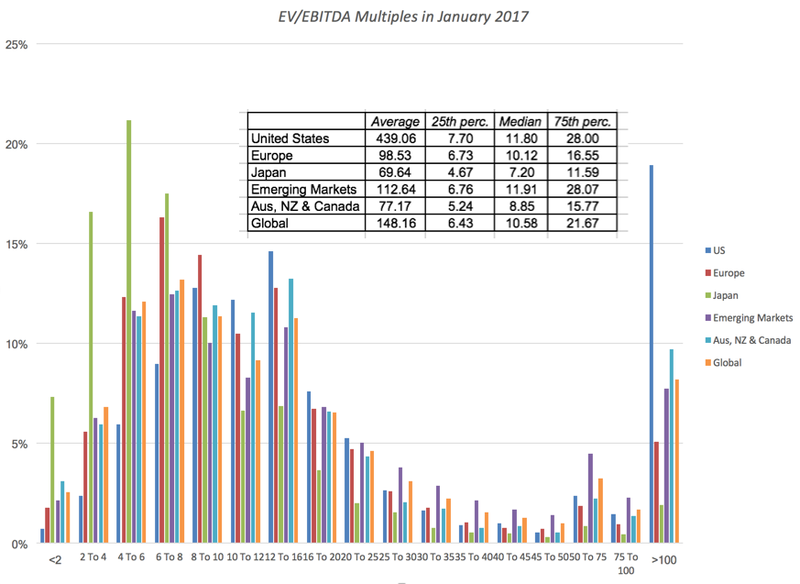 January 2017 Data Update 10: The Pricing Game! 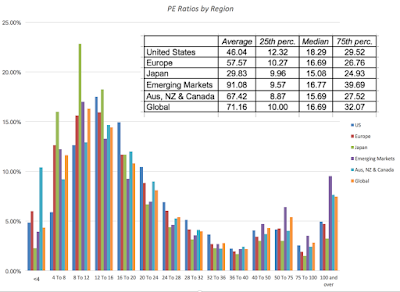 It's taken me a while to get here, but in this, the last of my ten posts looking at publicly traded companies globally, I look at pricing differences across regions and sectors. I laid out my rationale for looking at pricing in my most recent post on the topic, where I drew a distinction between good companies, good management and good investments, arguing that investing is about finding mismatches between reality (as driven by cash flows, growth and risk) and perception (as determined by the market). When looking at how stocks are priced and especially when comparing pricing across stocks, we almost invariably look at pricing multiples (PE, EV to EBITDA) rather than absolute prices. That is because prices per share are a function of the number of shares and are, in a sense, almost arbitrary. Before you respond with indignation, what I mean to say is that I can make the price per share decrease from $100/share to $10/share, by instituting a ten for one stock split, without changing anything about the company. As a consequence, a stock cannot be classified as cheap or expensive based on price per share and you can find Berkshire Hathaway to be under valued at $263,500 per share, while viewing a stock trading at 5 cents per share as hopelessly overvalued. The process of standardizing prices is straight forward. In the numerator, you need a market measure of value of equity, the entire firm (debt + equity) or the operating assets of the firm (debt + equity -cash = enterprise value). If you confused about the distinction, you may want to review this post of mine from the archives. In the denominator, you can scale the market value to revenues, earnings, accounting estimates of value (book value) or cash flows. As you can see, there is a very large number of standardized versions of value that you can calculate for firms, especially if you bring in variants on each individual variable in the denominator. With net income, for instance, you can look at income in the last fiscal year (current), the last twelve months (trailing) or the next year (forward). The one simple proposition that you should always follow is to be consistent in your definition of multiple. The "Consistent Multiple" Rule: If your numerator is the market value of equity (market capitalization or price per share), your denominator has to be an equity measure as well (net income or earnings per share, book value of equity. For example, a price earnings ratio is consistent, since both the numerator and denominator are equity values, and so is an EV to EBITDA multiple. A Price to EBITDA or a Price to Sales ratio is inconsistent, since the numerator is an equity value and the denominator is to the entire business, and will lead to conclusions that are not merited by the fundamentals. 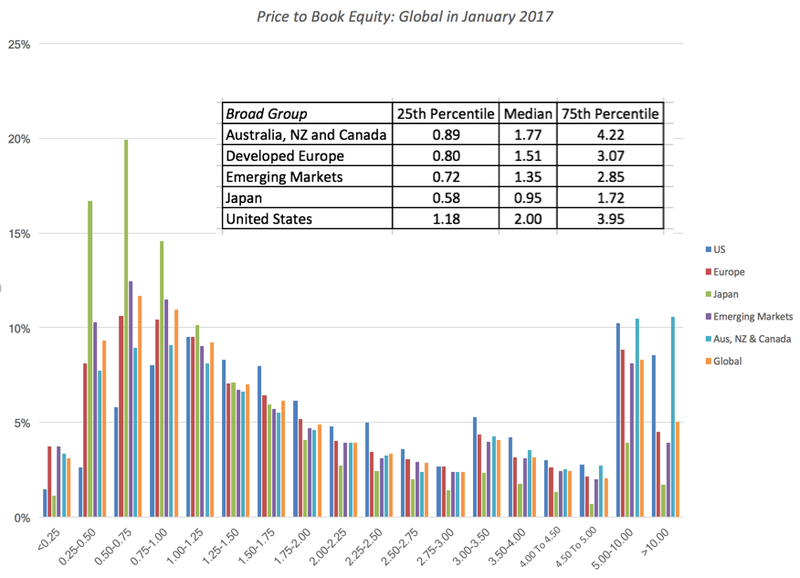 To see how stocks are priced around the world at the start of 2017, I focus on four multiples, the price earnings ratio, the price to book (equity) ratio, the EV/Sales multiple and EV/EBITDA. With each multiple, I will start with a histogram describing how stocks are priced globally (with sub-sector specifics) and then provide country specific numbers in heat maps. If you go to the live heat map, you will also be able to see the 25th and 75th quartiles within each country, or you can download the spreadsheet that contains the data. I mistrust PE ratios for many reasons. First, the more accountants can work on a number, the less trustworthy it becomes, and there is no more massaged, manipulated and mangled variable than earnings per share. Second, the sampling bias introduced by eliminating a large subset of your sample, by eliminating money losing companies, is immense. Third, it is the most volatile of all of the multiples as it is based upon earnings per share. 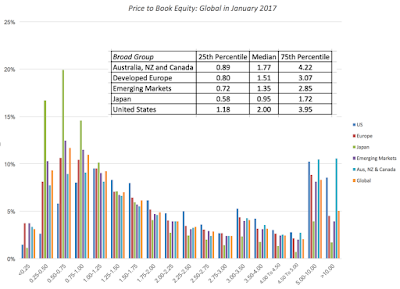 The price to book ratio has better sampling properties than price earnings ratios for the simple reason that there are far fewer firms with negative book equities (only about 10% of all firms globally) than with negative earnings. If you believe, as some do, that stocks that trade at less than book value are cheap, there is good news: you have lots and lots of buying opportunities (including the entire Japanese market). Following up, let’s take a look in the heat map below of median price to book ratios, by country. Again, you can see the 25th and 75th quartiles in either the live map or by downloading the spreadsheet with the data. Pausing to look at the numbers, note the countries shaded in green, which are the cheapest in the world, at least on a price to book basis, are concentrated in Africa and Eastern Europe, arguably among the riskiest parts of the world. The most expensive countries are China, a couple of outliers in Africa (Ivory Coast and Senegal, with very small sample sizes) and Argentina, a bit of a surprise. Again, there will be firms that had negative EBITDA that did not make the cut, but they are fewer in number than those with negative EPS. 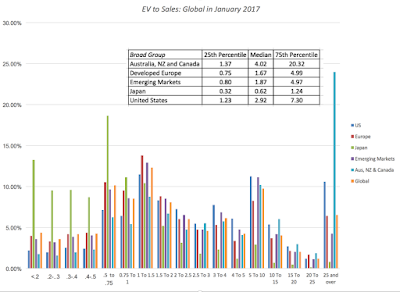 Looking at the median EV to EBITDA multiple by country in the heat map below, you can see the cheap spots and the expensive ones. As with the other data, you can get the lower and higher quartile data in the spreadsheet. As with price to book, the cheapest countries in the world lie in some of the riskiest parts of the world, in Africa and Eastern Europe. China remains among the most expensive countries in the world but Argentina which also made the list, on a price to book basis, drops back to the pack. You can download more extensive numbers in the spreadsheet. By now, the familiar pattern reasserts itself, with East European and African companies looking cheap and China looking expensive. With revenue multiples, Canada and Australia also enter the overvalued list, perhaps because of the preponderance of natural resource companies in these countries. In many of the cheapest sectors, the reasons for the low pricing are fundamental: low growth, high risk and an inability to generate high returns on equity or margins. Similarly, the highest PE sectors also tend to be in higher growth, high return on equity businesses. I will leave the judgment to you whether any fit the definition of a cheap company. The entire list of multiples, by sector, can be obtained by clicking on this spreadsheet. You can read this graph in one of two ways. 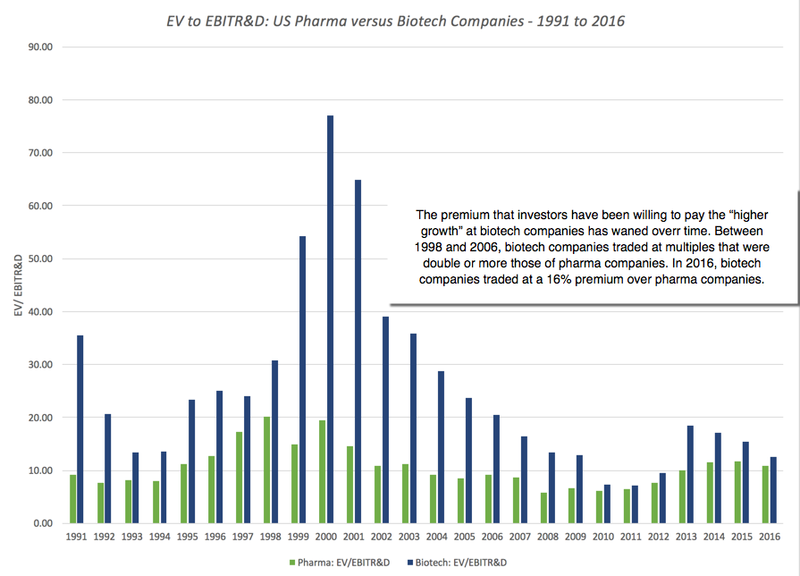 If you are a firm believer in mean reversion, you would load up on biotech stocks and hope that they revert back to their pre-2006 premiums, but I think you would be on dangerous ground. The declining premium is just as much a function of a changing health care business (with less pricing power for drug companies), increasing scale at biotech companies and more competition. Absolute rules of thumb are dangerous (and lazy): The investing world is full of rules of thumb for finding bargains. Companies that trade at less than book value are cheap, as are companies that trade at less than six times EBITDA or have PEG ratios less than one. Many of these rules have their roots in a different age, when data was difficult to access and there were no ready tools for analyzing them, other than abacuses and ledger sheets. In Ben Graham's day, the very fact that you had collected the data to run his "cheap stock" screens was your competitive advantage. In today's market, where you can download the entire market with the click of a button and tailor your Excel spreadsheet to compute and screen, it strikes me as odd that screens still remain based on absolute values. 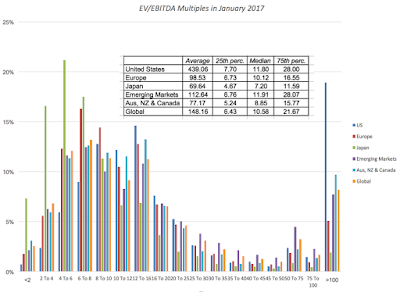 If you want to find cheap companies based upon EV to EBITDA, why not just compute the number for every company (as I have in my histogram) and then use the first quartile (25th percentile) as your cut off for cheap. 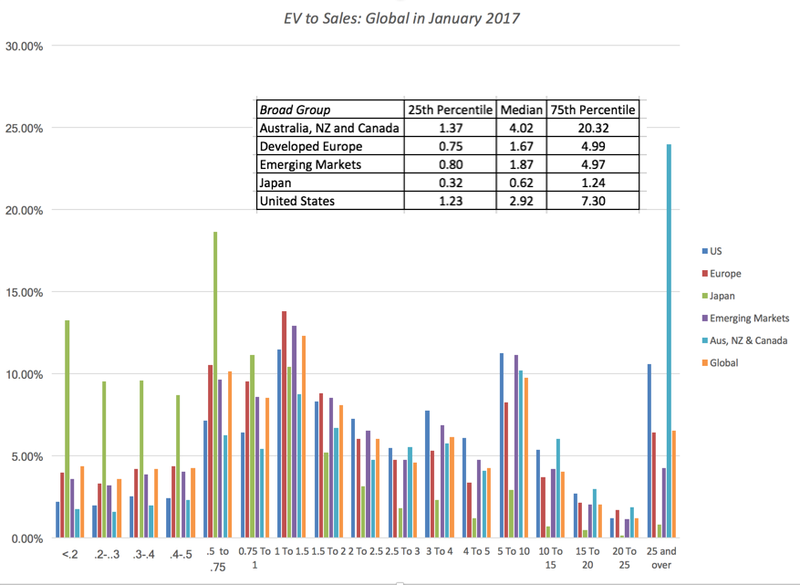 By my calculations, a company with an EV/EBITDA of 7.70 would be cheap in the United States but you would need an EV to EBITDA less than 4.67 to be cheap in Japan, at least in January 2017. Most stocks that look cheap deserve to be cheap: If your investment strategy is buying stocks that trade at low multiples of earnings and book value and waiting for them to recover, you are playing a game of mean reversion. It may work for you, but there is little that you are bringing to the investing table, and there is little that I would expect you to take away. If you want to price a stock, you have to bring in not just how cheap it is but also look at measures of value that may explain why the stock is cheap. If you are paying a price, you are "estimating" the future: When I do an intrinsic valuation (as I did a couple of weeks ago with Snap), I am often taken to task by some readers for playing God, i.e., forecasting revenue growth, margins and risk for a company with a very uncertain future. I accept that critique but I don't see an alternative. If your view is that using a multiple lets you evade this responsibility, it is because you have chosen not to look under the hood, If you pay 50 times revenues for a company, which is what you might be with Snap, you are making assumptions about revenue growth and margins, whether you like it or not. The only difference between us seems to be that I am being explicit about my assumptions, whereas your assumptions are implicit. In fact, they may be so implicit that you don't even know what they are, a decidedly dangerous place to be in investing. Data Update 5: A Taxing Year Ahead? Explaining a Paradox: Why Good (Bad) Companies can be Bad (Good) Investments! In nine posts, stretched out over almost two months, I have tried to describe how companies around the world make investments, finance them and decide how much cash to return to shareholders. Along the way, I have argued that a preponderance of publicly traded companies, across all regions, have trouble generating returns on the capital invested in them that exceeds the cost of capital. I have also presented evidence that there are entire sectors and regions that are characterized by financing and dividend policies that can be best described as dysfunctional, reflecting management inertia or ineptitude. The bottom line is that there are a lot more bad companies with bad managers than good companies with good ones in the public market place. In this, the last of my posts, I want to draw a distinction between good companies and good investments, arguing that a good company can often be a bad investment and a bad company can just as easily be a good investment. I am also going argue that not all good companies are well managed and that many bad companies have competent management. Investment advice often blurs the line between good companies, good management and good investments, using the argument that for a company to be a "good" company, it has to have good management, and if a company has good management, it should be a good investment. That is not true, but to see why, we have to be explicit about what makes for a good company, how we determine that it has good management and finally, the ingredients for a good investment. 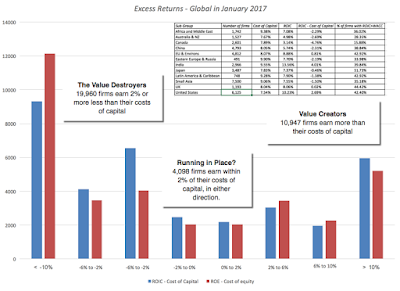 To the extent that you want the capital that you have invested in companies to generate excess returns, you could argue that the good companies in this graph as the value creators and the bad ones are the value destroyers. 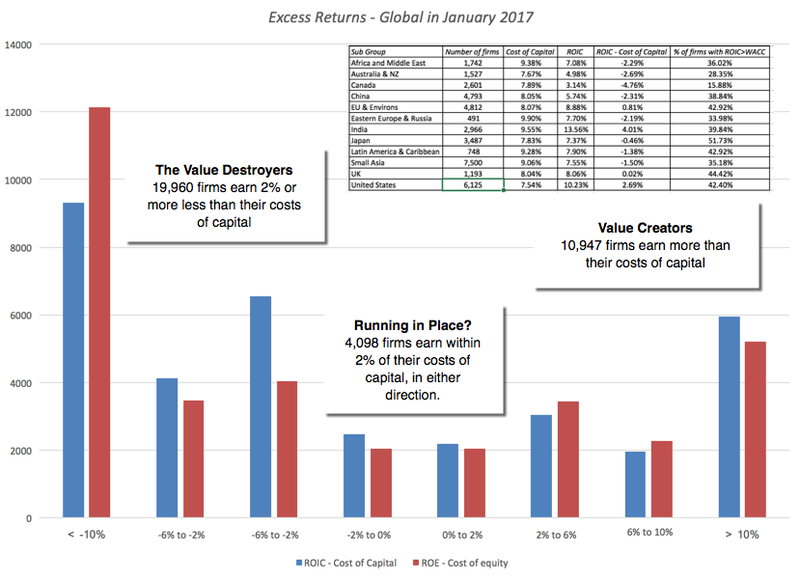 At least in 2017, there were a lot more value destroyers (19,960) than value creators (10,947) listed globally! If a company generates returns greater (less) than its opportunity cost (cost of capital), can we safely conclude that it is a well (badly) managed company? Not really! The “goodness” or “badness” of a company might just reflect the ageing of the company, its endowed barriers to entry or macro factors (exchange rate movements, country risk or commodity price volatility). The essence of good management is being realistic about where a company is in the life cycle and adapting decision making to reflect reality. If the value of a business is determined by its investment decisions (where it invests scarce resources), financing decisions (the amount and type of debt utilized) and dividend decisions (how much cash to return and in what form to the owners of the business), good management will try to optimize these decisions at their company. For a young growth company, this will translate into making investments that deliver growth and not over using debt or paying much in dividends. As the company matures, good management will shift to playing defense, protecting brand name and franchise value from competitive assault, using more debt and returning more cash to stockholders. At a declining company, the essence of “good” management is to not just avoid taking more investments in a bad business, but to extricate the company from its existing investments and to return cash to the business owners. My way of capturing the quality of a management is to value a company twice, once with the management in place (status quo) and once with new (and "optimal" management). I term the difference between the optimal value and the status quo value the “value of control” but I would argue it is also just as much a measure of management quality, with the value of control shrinking towards zero for “good” managers and increasing for bad ones. Now that we have working definitions of good companies and good managers, let’s think about good investments. For a company to be a good investment, you have to bring price into consideration. After all, the greatest company in the world with superb managers can be a bad investment, if it is priced too high. Conversely, the worst company in the world with inept management may be a good investment is the price is low enough. In investing therefore, the comparison is between the value that you attach to a company, given its fundamentals and the price at which it trades. As you can see at the bottom, investing becomes a search for mismatches, where the market's assessment of a company (and it's management) quality is out of sync with reality. Now what? This equation links PE to three variables, growth, risk (through the cost of equity) and the quality of growth (in the payout ratio or return on equity). Plugging in values for these variables into this equation, you will quickly find that companies that have low growth, high risk and abysmally low returns on equity should trade at low PE ratios and those with higher growth, lower risk and sold returns on equity, should trade at high PE ratios. If you are looking to screen for good investments, you therefore need to find stocks with low PE, high growth, a low cost of equity and a high return on equity. Using this approach, I list multiples and the screening mismatches that characterize cheap and expensive companies. If you are wondering about the contrast between equity risk and operating risk, the answer is simple. Operating risk reflects the risk of the businesses that you operate in, whereas equity risk reflects operating risk magnified by financial leverage; the former is measured with the cost of capital whereas the latter is captured in the cost of equity. With payout, my definition is broader than the conventional dividend-based one; I would include stock buybacks in my computation of cash returned, thus bringing a company like Apple to a high payout ratio. If the length of this post has led you to completely forget what the point of it was, I don’t blame you. So, let me summarize. Separating good companies from bad ones is easy, determining whether companies are well or badly managed is slightly more complicated but defining which companies are good investments is the biggest challenge. Good companies bring strong competitive advantages to a growing market and their results (high margins, high returns on capital) reflect these advantages. In well managed companies, the investing, financing and dividend decisions reflect what will maximize value for the company, thus allowing for the possibility that you can have good companies that are sub-optimally managed and bad companies that are well managed. Good investments require that you be able to buy at a price that is less than the value of the company, given its business and management.